Westerlo, N.Y. – Hannay Reels, the world leader in durable, high quality hose and cable reels for OEM and aftermarket applications, will showcase select items from its full line of industrial cable and hose reels for the construction industry at ConExpo 2014, March 4-8, at the Las Vegas Convention Center, Las Vegas, Nev.
Visit booth 62914 for a chance to win a Hannay Reels C16-10-11-DE portable storage cable reel, including 100 feet of 14/3 cable. 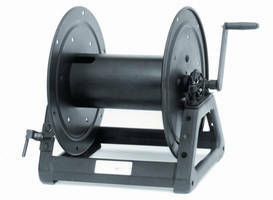 Equipped with a storage drum extension, this versatile, lightweight, durable reel easily manages long lengths of cable. It features an adjustable cam-lock drag device to brake the reel and a crank handle permanently attached to the disc. • N400 Series Spring Rewind Gas Welding Reel: Its narrow frame and compact mounting base are specifically designed to optimize space limitations and improve the safety and efficiency of welding operations. Features a heavy-duty spring motor and declutching arbor to prevent damage from reverse winding. Can handle pressures to 300 psi. 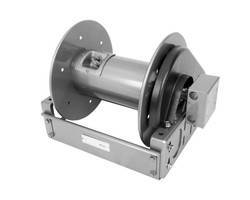 • N700 Series Spring Rewind Reel: Non-sparking ratchet assembly ensures safer operations in hazardous areas. Specially engineered to streamline a wide variety of industrial applications, including washdown, lubrication and assembly operations. Its narrow frame and compact base make it ideal for construction applications in limited-space work environments. 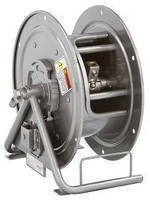 • 6000 Series Manual or Power Rewind Reel: Heavy-duty reel for longer lengths of single ½” through 1” l.D. hose. Its Durable construction and finish can stand up to corrosive materials. Ideal for use in fuel dispensing, fire protection, spray operations and water blasting operations. Handles pressures to 2000 psi and temperatures from -60° F to +250°F (-51° C to +212°C). 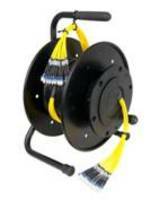 • WCR11-17-19 Manual Rewind Portable Reel: Rugged, portable reel with carrying handle and 400 amp rotary electrical device. For use with single-conductor electrode cable for grounding lead in arc welding applications.